Our Congo African Grey chicks are now 6 weeks old and I thought it would be interesting to show a comparison between the African Grey babies at 3 weeks and at 6 weeks. The chicks showed an interest in soft foods today for the first time and after realizing the food is quite tasty, they ate and played with the food for nearly an hour. The bare wings now have feathers and even the long feathers at the tips of the wings are developing quite fast. The red tail feathers, which are unique to the Congo African Grey parrots, have also developed and three distinct rows of tail feathers are present. Note the lone red feather just above the tail and the tuft of down just below. We weighed the chicks today and the smaller one weighs in at 550grams while the larger chick weighs a roaring 650 grams. They have more than doubled in size in three weeks. During the past weekend we cared for a 10 week old African Grey parrot. "Gogga" the parrot baby is already weaned and only wanted to taste the baby formula because the little ones ate. At one stage we had a total of five parrots ranging from 6 weeks to 8 years old on the kitchen table and it made for interesting play time. Gogga enjoyed climbing all over hubby while the little one sought refuge from the miniature windstorm Gogga created. In the photo's of the African Grey parrots below you can clearly see the difference in the eyes of an adult and baby parrot. The adult African Grey parrot has a yellow ring around the black pupil while the baby's eyes are nearly totally black. We have already found a home for the smaller baby African Grey parrot, but will only deliver after the chicks are completely weaned and able to fend for themselves. They are absolutely adorable and your article and information is very interesting. Please keep us posted and good luck with letting the little one go, it is going to be tough on you. Great blog and they really are adorable. If I may ask a question, how often did you feed them at 5 weeks? Thanks for the comment on the blog. 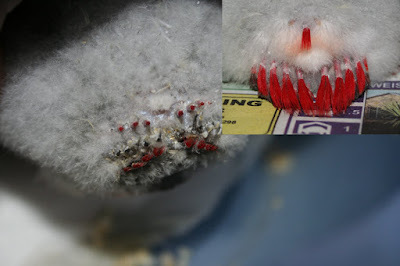 Feeding times vary from African Grey chick to chick. You need to pay attention to the chick's behavior when you feed it. We lengthened the feeding time to every six hours when the African Grey babies seemed still satisfied or when you can feel the crop hasn't emptied completely. At five weeks we still fed every 4 hours, day and night, but birds differ. Some will not take kindly to lengthening the times between feeds while others will gladly accept it and increase their intake at those feeds. 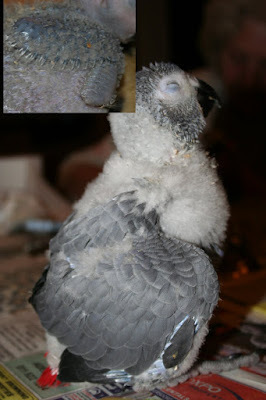 I have just purchased my fisrt African Grey at 5 weeks old. Please give me some tips and advice with regards to hand rearing. I want to know how much to feed at a time and how often. I am currently feeding 3 times daily approx 2 to 3 teaspoons mixed with water. I am using an avi product. 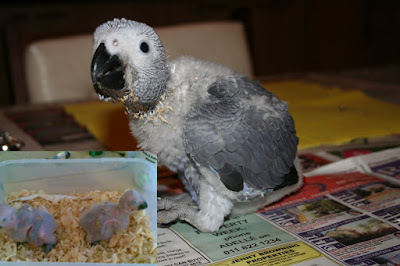 I hope I answered your questions in this post:http://yolandepienaar.blogspot.com/2010/10/how-much-to-feed-african-grey-parrot.html . Please feel free to ask away again if you need more info. I see you feed with a spoon? We used big syringes, but spoon feeding is fine with the bigger birds. Yolande, I have a CAG Chick that just hatched. II hade to take it from the mom befor hatching and now I need to know how many cc do i feed it. I cannot tell you exactly how much to feed the bird as it depends from bird to bird. I would suggest you ensure the formula is very watery in the beginning. Feed the bird until you feel the crop is firm, but not stiff. Keep a close eye on the little one for any signs of discomfort. At that age the temperature of the formula you feed also needs to be as close to 40 degrees Celsius as possible as cold food might cause sour crop and if the formula is too hot, you might burn the bird. After a week or so if you see the crop empties too quickly you can thicken the formula a little, but keep it smooth enough to run freely from a spoon. Hope this helps and good luck with the little one. I have been feeding my 6 week old CAG 50CC every 5 hours. When do i start making a change to start longer feeding times, and what would good hours to do feedings if so? Increasing the feeding times depends entirely on the bird. If your CAG seems still satisfied after 5 hours and you can see the crop is not empty, you can try to increase the feeding times to 6 hours. You should also by now be starting to introduce some soft food to him. At first he will most likely only play with it, but as soon as he realizes that it tastes quite well, he will dig in. This is a way to start weaning them gradually off the formula. Our baby is still being hand fed, and eating very little on his own. He is 10 weeks now, and I thinking of knocking it down to 2 feedings a day. Do you think this would be healthy? If I didn't have you on my side I wouldn't know what to do with out Rio.